American. Born January 19, 1944 in Waterbury, Connecticut. Education: BArch, U. So. Calif., 1968; MArch, Harvard U., 1978. Rome Prize fellow Am. Acad. Rome, 1987; recipient Architecture award Am. Acad. Arts and Letters, 1992, Pritzker Architecture Prize, 2005. He has been affiliated with numerous universities during his career and many exhibits have been held displaying his work. Reproduced from Biography Resource Center. Farmington Hills, Mich.: Thomson Gale. 2006. Available in DAAP Library Reference. Amelar, Sarah. “ Morphosis intertwines programs and forms for a campus recreation center at the University of Cincinnati.” Architectural Record v.194 n. 10 (2006): 100-109. Lubell, Sam. “Thom Mayne wins Pritzker Prize.” Architectural Record v.193 n. 4 (2005): 33. 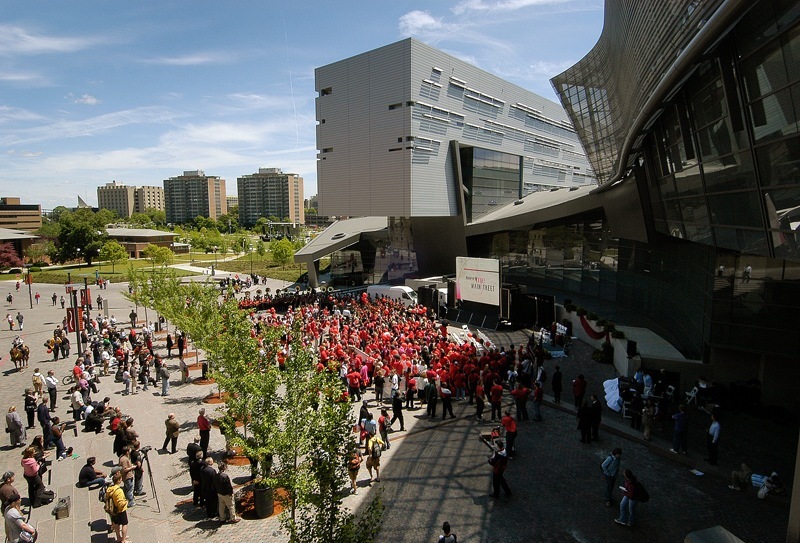 “University of Cincinnati Recreation Center Opens.” Architecture v. 95, n.3, (2006): 20. “Morphosis: University of Cincinnati Student Recreation Center, Cincinnati, OH U.S.A.” GA Document 2001 May, n. 65, 64-69. Available in DAAP Library Bound Journals.